The Cinque Terre and Portovenere are world famous tourist destinations and their extraordinary beauty is surpassed only by the chaos created by tourists on summer weekends. Luckily, there is a way to enjoy these wonders away from the crowds: a kayak allows admiring the coastline from a unique perspective and discovering the most beautiful aspects. So, by kayaking from Levanto to Portovenere, you can visit the Cinque Terre (Monterosso, Vernazza, Corniglia, Manarola and Riomaggiore), the red cliffs of the Tramonti, some deserted and otherwise unreachable beaches, and more. After the map of this part of Liguria there is the description of the kayaking itineraries along the coast. If you are interested in renting kayaks or in an organized kayaking trip along these routes in Liguria, contact us here: info@wildtrips.net or visit www.catchiavari.it. A tip on how to visit this stretch of Ligurian coast: in addition to normal kayaks, inflatable ones can be a perfect solution: they allow paddling in one direction from a train station to another, then deflating the kayak and going back by train. Please notice that the distances on the map are straight lines, but it is normal (actually, very recommended) to follow by kayak all the little bays and imposing rocks of the Ligurian coast. This first itinerary by kayak is not yet part of the Cinque Terre, but it already offers spectacular views. It could also be done in one day together with the Framura - Levanto itinerary described here. The last part of the itinerary is pleasant as well and leads to Monterosso, the first of the Cinque Terre. It's also the most populous and one with the widest beaches; the train station is right on the sea (which is ideal for those with an inflatable kayak) and on summer weekends the promenade is very busy, but the historic center is always picturesque. Punta Mesco, between Levanto and Monterosso, makes this quite short kayaking itinerary a special one. 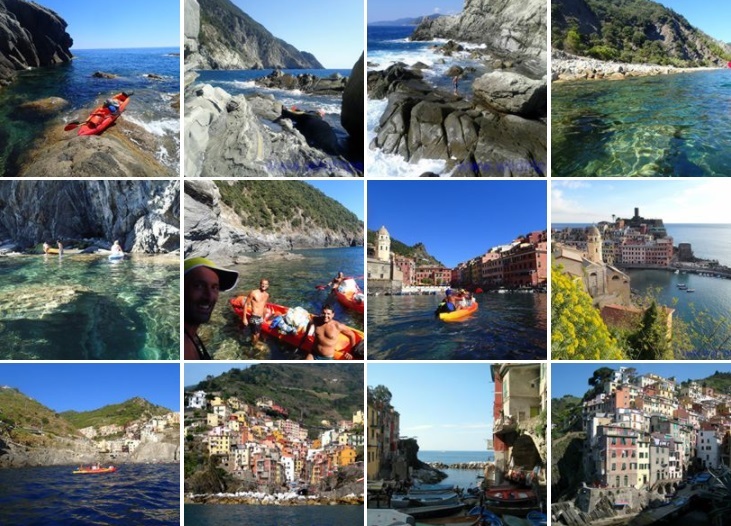 In one day it is possible to visit all the Cinque Terre by kayak. Starting from Monterosso, you meet immediately one of the most beautiful stretches of coastline that goes up to Vernazza. The cliffs and the terraced vineyards are a beautiful sight from the kayak. Vernazza is one of the symbols of the Cinque Terre, so you should really park your kayak on the beach at the bottom of the picturesque little port and walk through the alleys of the village. Just east of Vernazza there is a stony beach in part created by the terrible flood of 2011. Continuing to paddle under the cliffs, you arrive at Corniglia, with its houses overlooking the sea. You can moor the kayak here as weel, but to get into the the town center you must climb several steps. The coast is less attractive between Corniglia and Manarola, but the last two of the Cinque Terre (Manarola and the nearby Riomaggiore) are awesome; Riomaggiore is a good arrival or departure point for those with an inflatable kayak, as in its picturesque harbour you can rinse your kayak, the station is quite close and there are many trains stopping. Even if you leave the Cinque Terre, the best is yet to come. In fact, from Riomaggiore going East you meet a long sequence of increasingly high and spectacular cliffs under which you can paddle in crystal clear waters. Moreover, the unspoiled nature sometimes gives way to cultivated terraces and some old farms, giving this part of Liguria a unique flavor of rurality and history. By kayak you can also stop in some isolated and deserted pebble beaches. While approaching Portovenere, the red cliffs of Tramonti and the rocky pinnacles of Muzzerone make the landscape even more extreme, preparing the kayaker to the view of Portovenere with its castle and its church perched on the sea. Passing between Portovenere and the island of Palmaria, you will enter the Gulf of La Spezia. It's an impressive entrance! The conclusion of the itinerary in Portovenere allows watching the typical Ligurian houses standing on the sea. From here there are several ways to return to your base, if you have an inflatable kayak. Frequent buses connect Portovenere to La Spezia train station (they are often crowded so it could be risky to wave your paddle in the bus! ); otherwise, a ferry goes to the Cinque Terre and in Riomaggiore or in Monterosso you can catch a train; or, there is also a cheaper ferry to the port of La Spezia, but then you have to walk from the port to the train station for 2 kms. This magnificent itinerary starts from Portovenere, provides a tour of the three islands and ends again in Portovenere. So, it's convenient also for those who have a rigid kayak and want to travel by car. I have already been written about the beauty of Portovenere. In a few minutes you can cross the channel and reach the Palmaria islands (take attention to the boat traffic). Moving clockwise, initially you meet a cultivation of mussels; then a ruined of a tower in the middle of the sea, a few dozen meters offshore the island of Palmaria. By kayak you can reach the tower, moor somehow and explore the ancient ruins... it's highly recommended! By following the coasts of Palmaria along impressive cliffs, beaches and stretches of Mediterranean bush, you get to a more crowded portion of the island with camping, restaurant and beaches. After some seafood spaghetti, you can paddle to the island of Tino. The landscape becomes even wilder and more photogenic; the only flaw is that you can not go touch land in the island because it's military territory. It is exciting (and lawful) to paddle along the coast one meter away from the rocks. Tinetto is a tiny islet, but here you can go ashore and enjoy the incredible view on Tino and the open sea. In particular, the southern coast of Tino and Palmaria is a worthy continuation of the dramatic cliffs of Tramonti and Muzzerone. Paddling towards Portovenere, you meet caves, vertical walls... and a few goats on the rocks. On Tino the ruins of a fort are an interesting peculiarity. Skirting the Palmaria by kayak with admiration, joy and good spirit, you will return to the Gulf, in front of Portovenere, where you can end your trip with a glass of wine Vermentino or with a cold beer. All these parts of the coast deserve to be visited in depth. Obviously, some good kayakers with fast kayaks could paddle from Levanto to Portovenere in a loooong and intense day, but they would miss a lot of the beauty of the coast... A kayak is an ideal means of transport to enjoy the charm and the particularities of each bay, town, cliff or beach, so our advice is to visit this part of Liguria with more calm and to dedicate time to each section of the whole itinerary. You could also wild camp (where it is legal) or look for the most convenient places where to sleep here. Further from the coast, the hotels are cheaper.